Happiness can take many shapes and forms when it comes to fashion and style. As part of the POPSUGAR Insights "Find Your Happy" study, we surveyed women to determine what it means to be happy in specific vertical categories. We asked women to share the one thing that makes them happiest when it comes to fashion and style. Forty-eight percent of women said that their appearance makes them happiest. 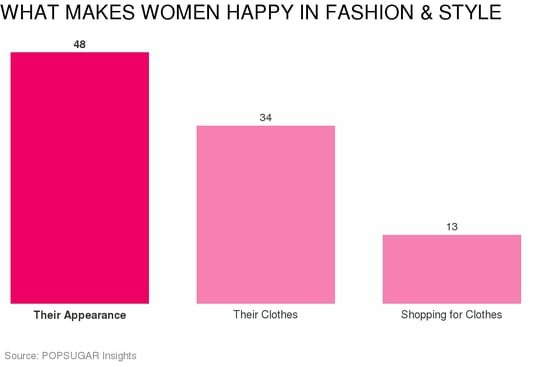 Thirty-four percent of women said that it's the clothes that make them happiest, and 13% of women cited the act of shopping for clothes as the thing that makes them happiest. Among women who cited "appearance" as the aspect of fashion and style that makes them happiest, 29% of women said that style is what matters the most. This was especially true of teenage girls age 13-17 (39%) and women age 18-24 (31%). Teens were especially more likely than other age groups to say that it's important that they express themselves through what they wear (12%). Among women who cited "clothing" as what makes them happiest, 20% of women said that "fit" mattered, including comfort and being comfortable (11%). This was especially true of women between the ages of 18 and 24.